Escaped from the spiders, but still in Mirkwood, our party is in a sorry state. Thorin is missing, their gear and weapons gone, and all weary and hungry. Capture and time spent as prisoners makes for an improvement over their present conditions. "There was no thought of a fight. Even if the dwarves had not been in such a state that they were actually glad to be captured, their small knives, the only weapons they had, would have been no use against the arrows of the elves that could hit a bird's eye in the dark. So they simply stopped dead and sat down and waited - all except Bilbo, who popped on his ring and slipped quickly to one side." Things don't look so good. The Elvenking is cagey and suspicious. The dwarfs are unbound not so much as a show of kindness, but a show of power. They are broken wretches within a fortress with magically sealed doors. Even proud Thorin teeters on the brink of offering a ransom from Smaug's horde, an extreme low for the dwarf king (though I personally feel the idea that such a ransom would make even a noticeable dent in the treasure a laughable notion). 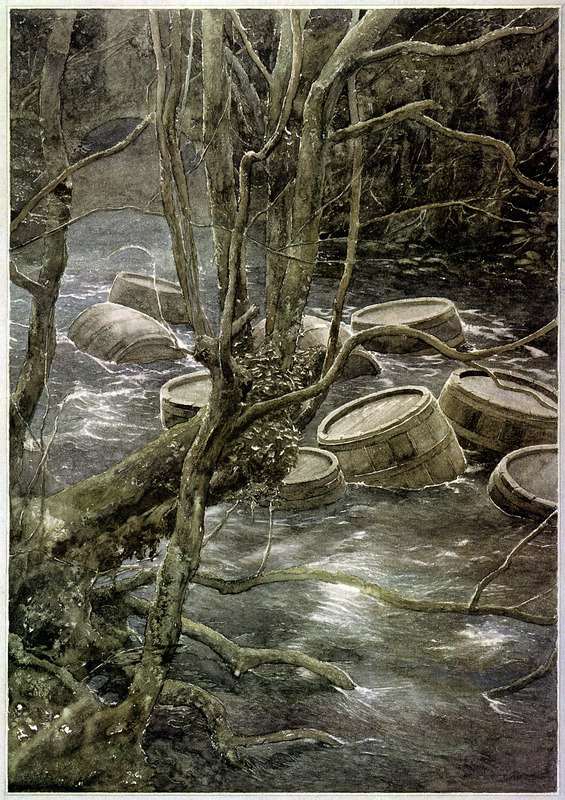 The tedium and despair even effects Bilbo, who feels the wearing effects of wearing the ring for weeks and surviving only on what he can pilfer without detection. Back when they escaped the goblins from under the Misty Mountain, Bilbo faced his duty to go rescue the dwarfs. Then it was ultimately unneeded. Here, he is the only one who can save them. "...they all trusted Bilbo. Just what Gandalf had said would happen, you see. Perhaps that was part of his reason for going off and leaving them." Not only that, but Bilbo gets a bit sassy with the dwarfs, telling them to take his solution or go back to their cells. I find the elves in this chapter to be more human than elven, with nothing besides the label to differentiate them. The elves of Rivendell are a bit silly, but knowing more than they perhaps should, and Elrond himself as a paragon of wisdom. These elves sing as well, but we get their petty quarrels, insults, and drinking on the job. Of course, I suppose it's only logical that within elven hierarchies there is discontent and slacking. "They had escaped the dungeons of the king and were through the wood, but whether alive or dead still remains to be seen." Makes for a very dark chapter ending indeed. Going on to the movie, well, I'm not exactly happy. This whole section wastes so much time while diverting us from the story and the actual passage of time within the book. We never get to see how long everything takes (or should be taking), it's just BAM! and we're there. Nothing takes long in this movie... except for the things that could be done quickly. The love triangle is both highly unnecessary and rather irksome. Then the escape becomes this huge mash-up of the two main unnecessary plot additions. All that stuff I have been bemoaning the loss of could have fit within this extra bit. I can totally see where kids must love the river escape. And that would make for an amazing water park ride. One thing that Jackson does is elevate the elves. In the books we get blurry snapshots. 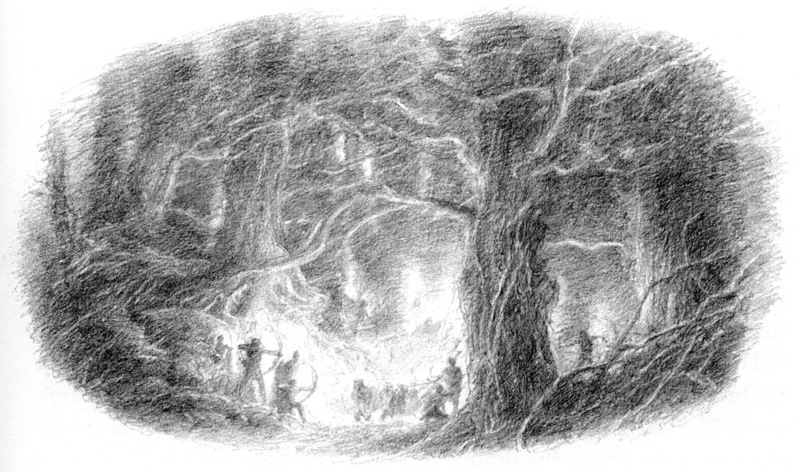 The elves of Rivendell seem silly and lighthearted, the elves of Mirkwood seem cagey and all too human. Jackson's elves are elegant, aloof, powerful, and all-to-aware of their immortality. I want to come out and say that I like Tauriel as a character, but that her part in the story was completely botched by the love story. According to canon she's a serious anomaly, being both a guard captain and a red-head, but hey, if they had to add in elf action, I can work with her. 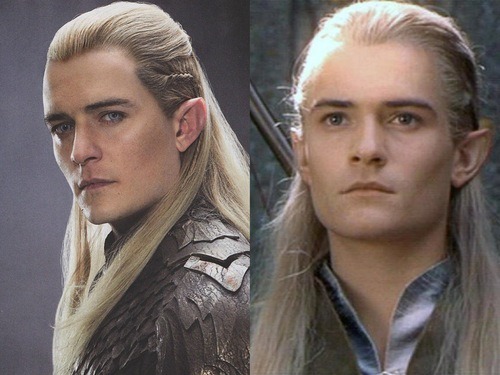 I'd be happier without the addition of Legolas, since that seems to be partly what necessitated some of the extra elf plot. Though I do get that Jackson went out of the way to include as many of the key LotR characters as possible, and lets be honest, little kids loved his action scenes (I got to hear some kid talk about how he bet that Legolas was going to be the one to kill Smaug). But Orlando? Take out the damn contacts!